This is the first in a new series on entries for Horticouture. People always ask me what my favorite plant is. Well, that's like choosing your favorite child (more difficult for some mothers than others). So, the "Fave Plant Rants" will showcase the plants that I would devote a place in my garden to if I had a limited amount of space. The Oriental Paperbush and its close cousin, the Indian Paperbush are fantastic, yet almost entirely unknown shrubs for the garden. Often they are called evergreen paperbushes, but in our temperate Washington, DC winters, they do eventually drop their leaves in the winter. These gems are often available only from specialty mail-order catalogs and are rarely found outside the gardens of collectors and botanical gardens in the US. However, a paperbush is certainly worth the effort to find and plant in your garden. During the growing season, the paperbush exhibits deep green leaves with a bluish-silver cast to them that are long, rounded and almost resemble the foliage of a Rhododendron. Although many would consider it a shrub to plant for spring interest, the foliage is actually very attractive and adds an interesting element of texture to any summer garden. In the late fall or early winter in temperate climates the leaves will eventually turn a beautiful golden yellow color before dropping off the plant to reveal its unique habit with gracefully upward arching branches covered in attractive light grey bark. After the leaves have senesced, the true gems of the paperbush are revealed. Drooping fuzzy white clusters of white buds decorate every branch tip almost as if someone had decorated the shrub for the holidays. One can't help but get a closer look to examine the buds and feel their silky texture. They are a promise of the spring to come and you will find yourself checking them throughout the cold winter months for any sign of swelling. Then, all of a sudden in late February (about the time that the witchhazels are blooming) you will notice the buds starting to perk up. They quickly come to life and on one of those surprisingly warm early winter days the buds will burst open showing their creamy yellow throats and releasing a cloud of ecstasy-inducing fragrance into the garden. The flowers will be buzzing with early honeybees and everyone who passes it will stop upon smelling the aroma and immediately begin a quest to find its source. There are very few plants that possess such magical power to enchant the senses at a time of the year when we all need a break from the monotony of winter. Edgeworthias originate in the mountainous forests and shrubby slopes of eastern Asia and have long been in cultivation in China and Japan. They prefer to be sited in rich garden soil that is slightly to moderately acid and rich in organic material. Moderate, consistent but well drained moisture is best. They are thought to be hardy from zone 7b to zone 10, with moderate success in colder portions of zone 7 and possibly protected garden situations in zone 6. 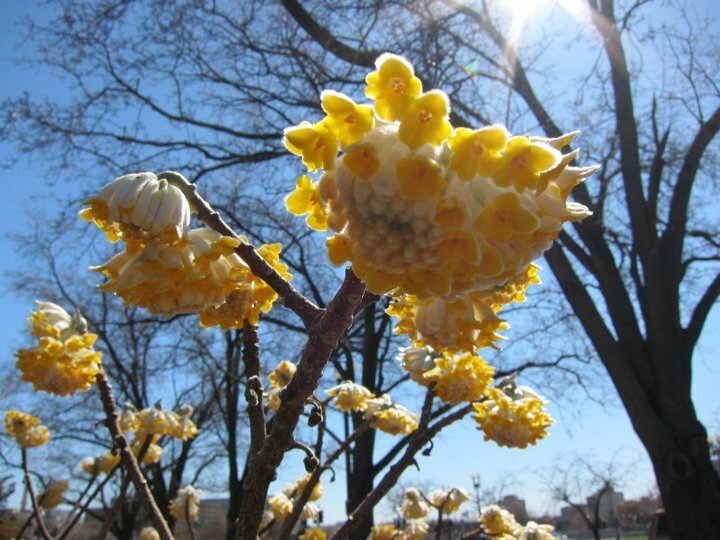 In some colder winter regions, plants may grow adequately, but flowering may be damaged by spring frosts. Plant in spring and supply with an initial feeding of organic fertilizer added to the root zone to encourage adequate root growth before the onset of cold weather in fall. Paperbushes are low-maintenance shrubs so even novice gardeners should have success with them. These fantastic specimens have only recently experienced some amount of popularity thanks to highest exaltations from many plant collectors and explorers. Recently, some mail-order companies have begun to offer some very exciting selections that I can't wait to try myself. Take the time to enjoy the links to more information included below. In "Fave Plant Rant", "Fragrance"